PORTLAND, OR and SEATTLE, WA--(Marketwired - Nov 12, 2013) - BETTERY Inc., the company reinventing the household battery market, today announced that it has teamed up with Safeway to give consumers a convenient way to adopt reusable household batteries, not only reducing their environmental footprint but also saving them money. BETTERY Swap Stations -- simple to use high-tech kiosks for purchasing and exchanging rechargeable batteries -- are being installed this month at multiple Safeway locations, starting with stores in Portland, Seattle and surrounding communities. With the addition of Safeway as its latest retail partner, BETTERY is well on its way to changing the way consumers purchase and use household batteries. Safeway is a Fortune 100 company with 1,415 locations in the US and 223 in western Canada. "At Safeway we are constantly looking for innovative partners like BETTERY who can help us create cleaner and healthier communities," said Steve Frisby, President of the Northwest Division of Safeway, Inc. "We're confident that together with BETTERY we can dramatically reduce the number of batteries that end up in landfills while giving our customers a great option for powering all of their household gadgets." More than 2.5 billion landfill-clogging household batteries are thrown away in the U.S. every year. The BETTERY Swap Stations allow for easy purchase and exchange of reusable AA and AAA batteries and serve as a drop-off site for recycling traditional single-use AA and AAA alkaline batteries. "Since our launch earlier this year, we are seeing tremendous response from consumers and retail and corporate partners alike," said BETTERY co-founder and CEO, Charlie Kawasaki. "Bringing BETTERY kiosks to Safeway locations is a huge step forward in our mission to change the way people buy and use batteries." BETTERY's state-of-the-art AA and AAA rechargeable batteries come in reusable packages of four. Purchasing and swapping a four-pack costs $2.50 (with a one-time $5 refundable deposit). Premium alkaline batteries can cost up to $6 per 4-pack in many stores. Formal launch events will be held throughout November at each location. Interested consumers near these stores should check the BETTERY website at www.betteryinc.com for details. In addition to its retail partnerships with Safeway and Whole Foods Markets, BETTERY is in discussions with several other major retailers and corporations for placement of Swap Stations in multiple U.S. cities. The company expects to announce additional deployments on an ongoing basis. BETTERY Inc. is a Portland, Ore.-based company that created a better way for consumers to use batteries. The company's innovative retail-based Swap Stations combine the convenience of single-use batteries with the value of rechargeables. Founded in 2011 by Charlie Kawasaki and Bill Coleman, with the mission the reduce waste by utilizing new generation NiMH batteries, BETTERY belongs to the movement of companies with sustainability at its core. With a veteran team of executives and advisors from major battery, kiosk and high tech companies, BETTERY is poised to reinvent the portable power industry. Visit http://www.BETTERYinc.com and follow us on Twitter at @BETTERYinc and Facebook at http://www.facebook.com/BETTERYinc. 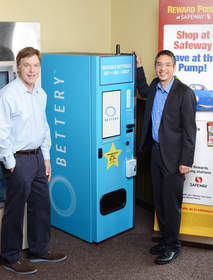 BETTERY is a U.S. registered trademark of BETTERY Inc.
McKenzie Worldwide for BETTERY Inc.
About this company BETTERY Inc.
BETTERY co-founders Bill Coleman (left) and Charlie Kawasaki with a new BETTERY Swap Station now installed at select Safeway locations in the Pacific Northwest.